In memory of Terry Cooper 1966 - 2015. The most amazing and inspirational person I have ever met. Who are 'Bee' and 'Vee'? They are a 1973 Black Tulip roadster and a 1975 Tahiti Blue Factory V8 currently in the custodianship of Paul Hunt in sunny Solihull UK (home of and just a poppadum from the only true and authentic Balti Houses outside Kashmir). Read about their purchase and use then go to 'Hammer and Spanner' to help keep yours on the road. 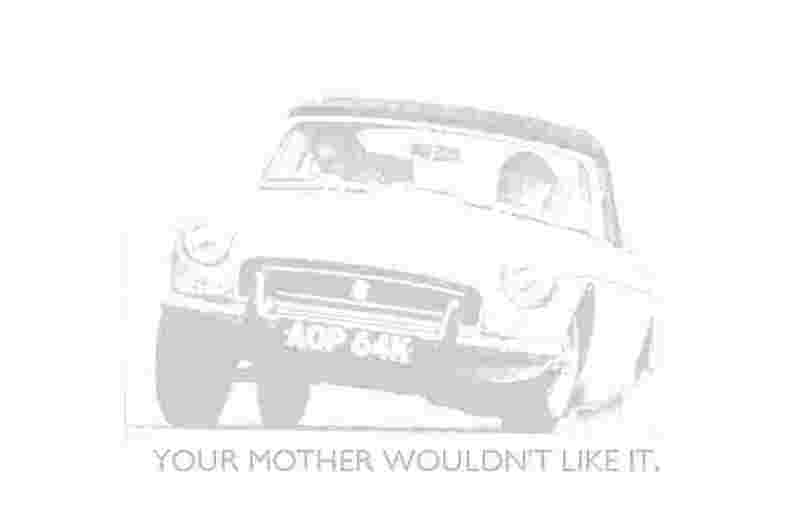 What started me on these pages was finding at a classic car show some modern reproductions of period MG advertising material as posters and postcards. 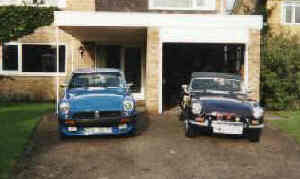 While I was at it I decided to add links to various MG sites including the one that increased my phone bill ten-fold - the superb MG Enthusiasts. If you visit no other site on a regular basis, you must visit this one. Speaking of visits, if any LBC enthusiast only ever goes to one museum it has to be the British Motor Museum (formerly Heritage Motor Centre) at Gaydon, Warwickshire. You want books? Over 250 MG books in my virtual bookcase. Confused about the UK Registration system? Have a look at the UK and International info on my Registrations page. Once I had done the MG pages I couldn't miss the opportunity of doing my bit as a evangelist. For me Jean Bugatti's Type 55 roadster is the most beautiful car of all time, closely followed by the Type 35 Grand Prix car. These two cars are the ones that I would most dearly like to drive, or even ride in. Believe it or not these cars are regularly driven in anger at places like the Bugatti Owners Club hill-climb circuit near Cheltenham in the May Classic and the August VSCC meetings, and the last time I was aware of a Type 55 changing hands it was for eight million pounds Sterling! Speaking of drives, my son Matthew wanted a Rally driving course for his 21st birthday, I didn't take much convincing to join him. We went to the in mid-Wales, a genuine Welsh forest stage. Great fun, but hard work both technically and physically. As a result of an ad in early in 1998 and with the superb organisation of Nick Duncan of I joined that most exclusive of clubs and drove a 1990 Formula 1 Grand Prix car. Fancy a go? Have a look at AGS Formule 1. My F1 page includes links to other Formula 1 stuff like a Senna memorial page, a Nigel Mansell page, jokes and anagrams. And no F1 page would be complete without 'Muddly Talker' himself. Continuing the speed theme, 1998 saw the breaking of the sound barrier on land for the first time, by the British Thrust SSC team. 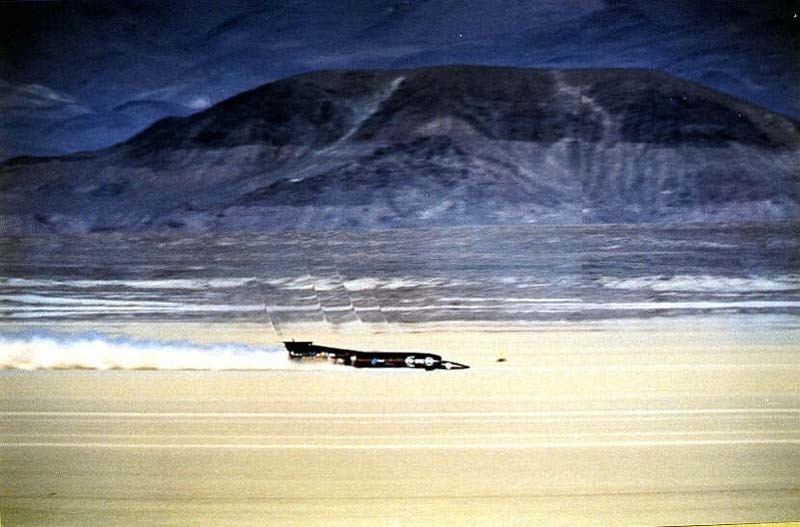 It should be remembered that the driving force (pun intended) behind Thrust SSC was Richard Noble OBE who broke the World Land Speed record himself in 1984 in Thrust II and held it until Andy Green took it in the SSC car. The pictures of the shockwave breaking across the desert and refracting the light above the car were fantastic (from http://www.andrewgraves.biz/ssc_stuff/SSC_pics.htm). Not content with having held the World Land Speed in his own right with Thrust II until leading the team that saw Andy Green break the sound barrier in Thrust SSC, Richard Noble and his team propose to increase their still-held record to over 1000mph with Project Bloodhound. December 2018: Just months away from completing the build and transferring to South Africa the project entered administration in October after problems with supplier failures and funding, still needing �25M to complete the project. At one point was available to purchase for �250,000. On December 11th it was announced that attempts to secure an investor had failed, but just a week later on the 17th December a UK entrepreneur had purchased the business and assets which will allow the project to continue, more news early in the new year. So. An interest in classic cars is well established. But I am also fascinated by Britain's industrial heritage that powered the world for so many years. As a fan of Fred Dibnah I was chuffed (pun intended) to see he has a new series (Industrial Age) on BBC TV. If you have never heard of Fred, he is a fascinating bloke. Born in Bolton towards the end of Britain's supremacy in engineering, he grew up surrounded by steam power. Fred became a steeple-jack - repairing, then demolishing, and now restoring factory chimneys and the machinery under them. Fred has built himself a steam-powered workshop that he uses in his restoration work. Update February 2000: Fred's second BBC TV series - Magnificent Monuments - has him wearing a hard-hat on some locations, but typical Fred, he wears it over his cap! It takes the Blackpool Big Dipper to remove it (and his glasses). Update November 2004: Sadly Fred has died, through illness, way before his time. He will be missed. His final series, 'Made in Britain' shown on BBC in April and May 2005, was a 1000 mile tour on his newly restored traction engine round many of the industrial sites in England, Scotland and Wales that produced the raw material and processed it into the components that went into making things like his traction engine. Some sites are now museums but the surprise was that the majority are still working companies, the last vestiges of a huge industry, that still manufacture parts in much the same way they always did. The culmination of the trip was taking his traction engine through the streets of London to Buckingham Palace to receive his MBE, for services to industrial heritage and broadcasting, from the Queen. Fred had also received honorary Doctorates from Birmingham and Glasgow (I think) universities for what he called 'backyard engineering'. If you have any interest at all in industrial heritage then you must visit the Ironbridge Gorge Museum in Shropshire. Ironbridge was the birthplace of the industrial revolution, and is one of only fourteen World Heritage sites in Britain. It can easily take a couple of days or more to get round all the sites. Another good site is the Black Country Museum in Dudley where you can visit canals, mine workings, industry, homes, shops and even buy sweets and things with old money at old prices! (Mind you, you have to buy the old money at the current 'exchange' rate). For a Black Country site covering industry genealogy, beer and many links, try The Black Country Pages. Finally a dedication to the memory of my much loved father-in-law Harry Munn. Harry was at Dunkirk in 1939, but it is a part of the Dunkirk story that all too few people know about. It was only relatively recently that Harry felt able to put down his wartime experiences on paper, and then only some. I would appreciate it if you could take the time to read them. Any comments or problems? Let me know by eMail or leave a message in my Guest Book.